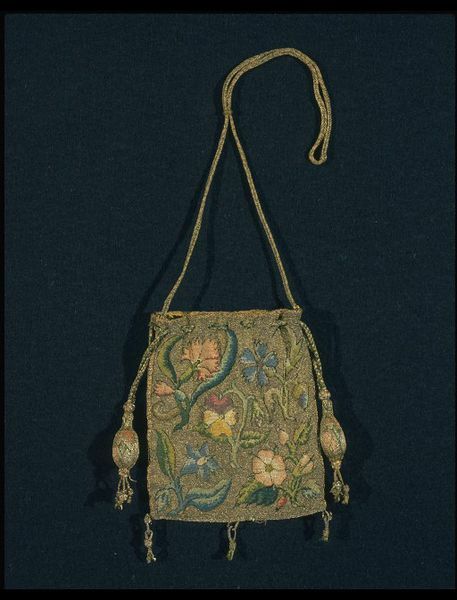 In the 17th century, decorative purses such as this one were rarely used to carry money. Their wealthy owners engaged in few commercial exchanges requiring cash. In addition to serving as 'sweet bags' or 'gift wrapping', purses sometimes contained mirrors for grooming. Others functioned as sewing kits which held needles, thread and tiny scissors. 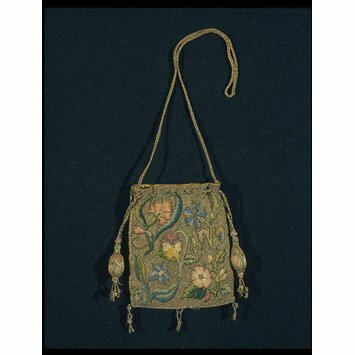 Canvas work was a popular form of embroidery in the 17th century. It used a linen canvas ground with an open weave so that stitches of silk or metal thread could be worked over each intersection of warp and weft in a regular manner. A variety of stitches such as tent, cross, plait and Gobelin stitch, appear in canvas work. The floral pattern of cornflower, carnation, pansy, borage and rose is typical of early English 17th-century embroidery. A variety of embroidery pattern books offered similar designs to be used on nightcaps, coifs, purses and other accessories. 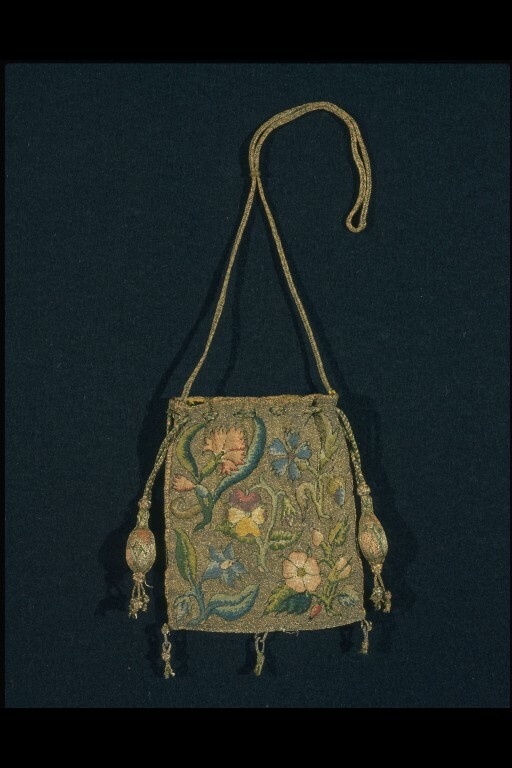 Purse of embroidered linen canvas with silk and silver-gilt threads in tent and stem stitch. The background is worked in tent stitch in silver-gilt thread. Floral pattern on each side. Lined with yellow silk. At the top are drawstrings of plaited green and pink silk and silver-gilt thread with a horn ring and two bobbles embroidered with rosebuds with little knots and tassels hanging from them. Three loops and tassels at the bottom.